Last week at the Magical Words blogsite, which I helped found so many years ago with Faith Hunter, Misty Massey, and C.E Murphy, I posted about plotting versus pantsing. For those not in the writing profession, plotting refers to setting out an outline at the beginning of a project and allowing that outline to guide us through the process of crafting our novels. Pantsing — as in flying by the seat of one’s pants — refers to winging it, essentially writing a novel without having a clear idea of where it’s going. I am have been, throughout much of my career, a dedicated plotter. But with the third book in the Case Files of Justis Fearsson, I was unable to come up with a decent outline, and so I dove in and just wrote the darn thing. That’s what the post was about (you can read it here). Well, as I always do with a book, upon finishing the first draft, I put it away with the intention of coming back to it several weeks later in order to revise and polish before submitting it to my editor at Baen. Today, five weeks after completing the book, I began to read through the manuscript, unsure of what I would find. I’m a little more than a third of the way through the novel. I’ve found some things that needed changing, and I’ve refined my wording here and there. But so far, overall, I like the book very much. In this case, it seems, pantsing was the write approach. We’ll see if I still feel that way when I’m finished reading it. Sewanee Book Signing Next Friday! It’s late on a Friday, not the best time to be making public service announcements. But I am very excited to say that I will be signing books in my home town of Sewanee, Tennessee, a week from today. Friday, January 30, from noon to 2:00 I’ll be in the University bookstore signing copies of Spell Blind, the first book in the Case Files of Justis Fearsson, as well as copies of all the Thieftaker books. So, Sewanee, hope to see you there! I am back home, after a ten-day road trip that included a couple of successful book signing events, a Guest of Honor appearance at MarsCon 25, at least ten stock signings at bookstores in Virginia and North Carolina, and visits with some of my favorite people in the world. It was a great trip. The only thing greater, is getting back to my wife and daughters, and settling back in to my home. I am grateful to the folks at Fountain Bookstore in Richmond and the BooKnack in Rock Hill for hosting the signings. I had a great time hanging out with Bishop O’Connell at the Richmond signing and my wonderful friend Faith Hunter at the BooKnack. I’m also grateful to the store managers in Charlottesville and Norfolk, Cary and Durham, Raleigh and Hampton Roads, and all the other places I stopped in along the way, for carrying my books and allowing me to sign stock. I loved being at MarsCon, and can’t thank enough the great folks who run and attend the convention. And finally, I am so grateful to my friends who hosted me during the trip — Amy and Paul, Elizabeth and Trip, Faith and Rod. Thank you all so much. It was so much fun to see you. Today’s installment in the continuing, unofficial Winter 2014-15 Spell Blind Blog Tour (which is way too much of a mouthful) can be found at the Magical Words blog site. The post is about plotting and pantsing — the age-old tension between wanting to outline our stories before we write them so as to keep our narratives clear and coherent, and wanting to let our narratives flow “organically” in the moment of creation. You can find the post here. I hope you enjoy it. Yesterday I received one of those emails that authors usually hate to get. A reader wrote to let me know that there were a couple of details in my new novel, Spell Blind (book I in The Case Files of Justis Fearsson) that I had wrong. I work hard on my research, and on those occasions when I happen to get something wrong, I am deeply disappointed in myself. And I have received messages in the past from readers who, let us say, did not handle the situation in a socially appropriate way, which makes the whole thing that much worse. This time, though, the reader in question, did everything right. His email was courteous, informative, and respectful. It was clear to me that he wrote not to criticize, but rather to help. He was even kind enough to tell me that the small inaccuracies he found did not keep him from enjoying the novel. And armed with what he told me, I will be sure to avoid these errors in subsequent volumes of the series. I’m grateful to him for his help, and for his willingness to take the time to contact me. I’m sharing this with you because I think we can all learn from this gentleman’s professional and thoughtful approach to contacting me. Just about every author has faced this at one time or another. We’re human, and sometimes we get things wrong. But I’ve been sent emails about mistakes I’ve made that were rude to the point of abusiveness. In fact, I’ve received emails “correcting” things that I DIDN’T get wrong, that were rude. There is nothing wrong with sharing our knowledge in circumstances such as these. As I said, his email helped me. But there is no need for cruelty, for abuse, for name-calling. Not to be too glib, but it’s one thing to be helpful, it’s another to be hurtful. And what were my mistakes, and why would I share them here? Well, I’m always willing to share my good news — nice reviews, new sales, etc. This time, I messed up, as all writers do from time to time, and I feel that I should share that, too. Early in the book, Justis Fearsson, my point of view character, mentions that he is licensed to own a firearm in Arizona. Arizona doesn’t issue such licenses. I also said that Jay became a detective in the robbery detail of the Phoenix Police Department upon graduating from the police academy. As it turns out, the PPD requires two years of uniformed duty before an officer can be assigned such a unit. These are small matters that have little bearing on the plotting or character arcs. But that doesn’t excuse my mistakes. I got these things wrong, and I apologize for that. I’m exhausted after a great weekend at MarsCon. Tomorrow I leave Williamsburg to do a few stock signings in North Carolina and then two bookstore events later in the week: a signing at the Books-A-Million in Gastonia, North Carolina on Tuesday (4-6) and then a signing at the BooKnack in Rock Hill, South Carolina with Faith Hunter on Wednesday (5:30-8:00). 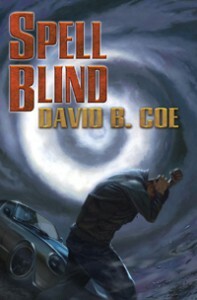 I’ll be signing copies of Spell Blind, the first book in my new series from Baen, The Case Files of Justis Fearsson, and also copies of my Thieftaker books (Thieftaker, Thieves’ Quarry, and A Plunder of Souls) which I write as D.B. Jackson. Hope to see many of you along the way. Panels on the best genre books of the past quarter century and overcoming writing blocks in our novels, readings and signings with the wonderful Alethea Kontis, David Weber, and Katherine Kurtz, countless conversations both serious and fun: Just another day at MarsCon 25. Still more to come this evening, including the masquerade and the charity auction, and right now I’m trying to grab a bit of down time. But it’s been a terrific convention so far. Well today, after a fun breakfast with the MarsCon staff, I drove out to the Colonial National Parkway, a gorgeous road that follows the course of the York River for a stretch. I did some birdwatching along the way, seeing eagles, ducks, loons, cormorants, and grebes, had a terrific lunch of clam chowder and fried oysters at the Yorktown Pub, walked around the Yorktown waterfront for a bit, and then headed back to the hotel. I have plenty to do the rest of the weekend, and I know that the folks here at MarsCon will take good care of me. But for a few hours this morning, I got away from work and experienced a small part of what makes this part of Virginia such a special place. From the Road . . . I have arrived in Williamsburg, Virginia for MarsCon 25, which begins tomorrow. I was literary Guest of Honor at MarsCon back in 2013, or maybe it was 2012. Whichever it was, I had a great time here, and when the folks who run the convention decided to invite back some of their former GoHs for this silver anniversary con, I was delighted to accept. Some of my favorite people will be here this weekend, and I’m looking forward to catching up with them, as well as meeting some new folks. I spent the day driving from Richmond to the Virginia Beach-Hampton Roads-Newport News-Norfolk area, where I stopped in at several bookstores to sign stock. This after a wonderful signing last night with Bishop O’Connell at the fabulous Fountain Bookstore in downtown Richmond. The stock signings I did today went well — every store I visited had multiple copies of Spell Blind as well as copies of my Thieftaker books. And all the staff workers I met were friendly and professional. The drive east from Richmond was beautiful. This entire area was hit by an ice storm yesterday, and this morning, with the sun struggling to break through a blanket of high clouds, the trees lining the highway were still glazed, so that their branches seemed to glow in the silver light. Gorgeous. Later, nearer to the ocean, I saw a Bald Eagle circling over the road, and then a Peregrine Falcon diving for pigeons just outside of Norfolk. A good day, and, I’m sure, the prelude to a great weekend. A New Interview is Up! My friend Joshua Palmatier (aka Benjamin Tate) has interviewed me about the release of Spell Blind, the first book in the Case Files of Justis Fearsson. We talk about pseudonyms, urban fantasy, and character development, and, of course, we do so with panache. So check it out. You can find the interview here. TIME’S CHILDREN Blog Tour Info! David B. Coe on Welcome! Copyright © David B. Coe, 1997-2019. All rights reserved. All materials included on this website are the sole property of the author and may not be used or reproduced for any purpose without his permission.